Based on true events. A set of everyday Nigerian travelers board the last Flamingo Airways flight scheduled to fly from Lagos to Abuja on a fateful Friday night in 2006. The plane cruises at 19,000 feet, tranquil and on schedule. A turn of fate occurs for our characters through a mixture of human error, technical failure and sheer bad luck, the plane rapidly develops major difficulties that puts it teetering on the brink of disaster. As the pilots fight with the controls of the airplane, a series of flashbacks unravel the twists, turns and leaps of fate that put each passenger on the fateful flight. Young lovers, an elderly couple, a corporate party, a sportsman on the threshold of greatness; all the passengers are caught up in the nightmare scenario and sense the final moments of their lives approaching. All except one. What does he know? 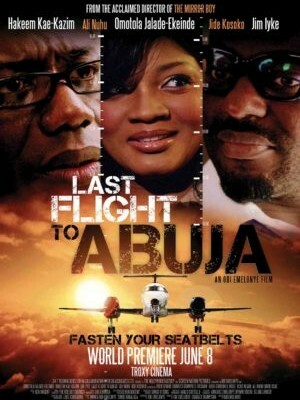 Will they survive the last flight to Abuja? “NEWS INTERNATIONALES: Afrique. (French).” Cahiers Du Cinema 690 (2013): 82.Film & Television Literature Index. Web. 19 Nov. 2013.